We got a brief glimpse of the HP SlateBook back in April. We were a bit confused as to why the consumer PC giant would cram Android into a form factor almost exclusively dominated by Windows and OS X machines. Now the 14-inch, Android-powered laptop is official, and we're no less puzzled. 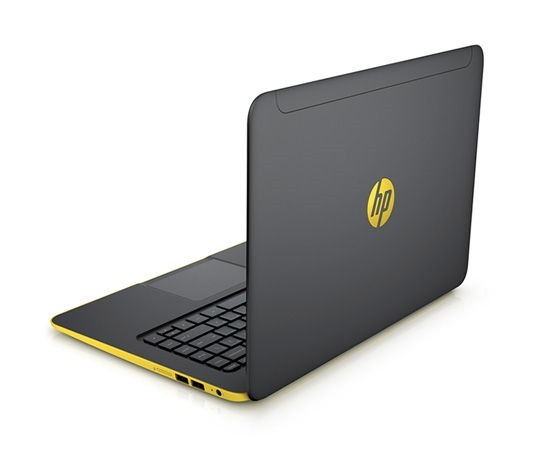 HP made the announcement today, though the laptop won't go on sale until July 20th in the US. The starting price for the 16GB model will be $399. First: this is a conventional laptop, not a tablet with a removable dock, like previous Android-powered members of the "Slatebook" line. It runs on ARM hardware, so the Android build isn't x86 as you might guess. Underneath the matte black shell with yellow trim lies an NVIDIA Tegra 4 processor - plenty fast and powerful, but a bit long in the tooth since Tegra K1 devices will be hitting the market soon. It's paired to 2GB of RAM and 16, 32, or 64GB of storage, depending on the configuration, plus a MicroSD card reader. Since the press release says $429.99 and the promotional page says $399, I assume that the bumps in storage will start at a $30 premium. Also, the 16GB and 64GB models are marked "WiFi only," so a 32GB variant may be equipped with a SIM card slot and a mobile broadband radio at some point. At .63 inches thin and 3.75 pounds, the SlateBook is neither svelte nor bulky, though the striking yellow trim has a certain charm. The 10-point 14-inch touchscreen has a full 1080p resolution, which is practically a must for a 14" Android device, but a definite perk if you're looking at it as a laptop alone. 270 nits of brightness is about average for current laptops. Four Beats-certified speakers and an HD webcam round out the media options. Ports include a pair of USB 2.0, one USB 3.0, and HDMI 1.4, and the laptop is equipped with Miracast for wireless displays. HP says the SlateBook will run for 9 hours on a charge. The software is Android 4.3, and yes, it includes access to the Google Play Store. It seems HP has left the interface alone for the most part, including, strangely, the standard virtual navigation buttons on the touchscreen. It looks like there are quite a few pack-in items as well: HP's promo page shows an alternative game store, HP's cloud printing app, and several other icons. The real question is, why would anyone pick up the SlateBook over a similarly-priced laptop running Windows or even Chrome OS? HP alone makes several models in the same price range or lower, and this laptop would seem to compete directly with Samsung's new 13" Chromebook, also running on ARM hardware with a 1080p screen. True, there are more Android apps available than Chrome apps (which are essentially just web apps anyway), but very, very few of them are made to take full advantage of a keyboard or screens larger than 10 inches. The SlateBook isn't the first laptop to run Android, but it is the first one to come from a major manufacturer with plans for wide distribution. It will be interesting to see how the market reacts - high sales will probably mean more SlateBook laptops at different price points, while low sales will mean this model becomes a footnote in Android's diverse history. PALO ALTO, CA--(Marketwired - Jun 1, 2014) - HP (NYSE: HPQ) today announced new milestones in the transformation of its consumer personal systems portfolio with a host of innovative form factors, and multiple operating system (OS) options, including a new notebook powered by Android. Unique two-in-one PC designs, including two new 360° convertible PCs and a new detachable PC, give customers the performance and mobility they want and need. 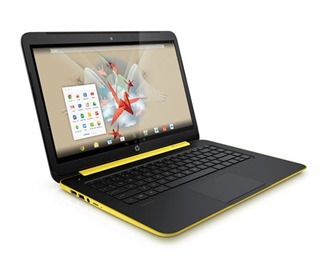 Additionally, HP's new Chromebook introduces new colors and designs for customers who want a quick and easy way to complete everyday tasks, while HP's new Android-based notebook makes popular Android apps available in a clamshell design. "Customers have made it clear that they need devices that better adapt to work and play the way they do," said Mike Nash, vice president, Product Management, Consumer Personal Systems, HP. "Today, we are announcing the next generation of laptops and two-in-one PCs, along with a new Chromebook that combine power, versatility and design for home and on the go." HP is extending its lineup of touch convertible PCs with the new HP ENVY x360 and the next-generation HP Pavilion x360, both of which enable customers to switch easily from a notebook to a stand, tent or tablet. The HP ENVY x360 is ideal for customers looking for a high-performance PC that bridges the gap between work and play. Featuring a powerful Intel® Core™ processor, 15.6-inch diagonal Full HD(1) 10-point touch screen display, and the HP Control Zone™ trackpad that transforms the Windows 8.1 experience,(2) the HP ENVY x360 is designed to tackle any task, while its unique hinge enables users to seamlessly shift to tablet or tent mode for watching videos or playing games. The HP Pavilion x360 has a 13.3-inch diagonal touchscreen and is available in multiple colors for customers who want enhanced productivity and mobility at a value price. Built with the latest Intel or AMD processors, the HP Pavilion x360 keeps up with the most demanding tasks while delivering next-generation entertainment with a 10-point touch screen and Beats Audio™. The HP Split x2 enables users to shift effortlessly from work to play by combining tablet portability with notebook productivity in a sleek, lightweight device. Feature packed with a powerful Intel Core processor, a 10-point touchscreen display and an ultra-quiet fanless design, the HP Split x2 combines power and portability with the Windows 8.1 OS. With an advanced hinge design and optional dual battery system -- one battery in the base and one in the tablet -- users can easily switch from notebook to tablet and back on this 13.3-inch detachable PC. 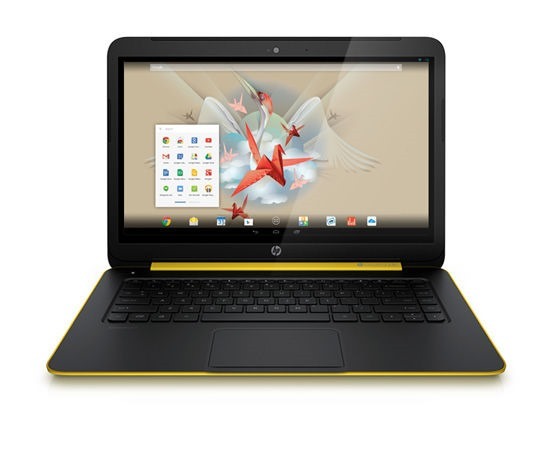 The HP Chromebook is a thin notebook with an11.6-inch diagonal HD(1) display that enables customers to quickly connect to their favorite websites, online music and videos,(3) and tens of thousands of apps in the Chrome Web Store. 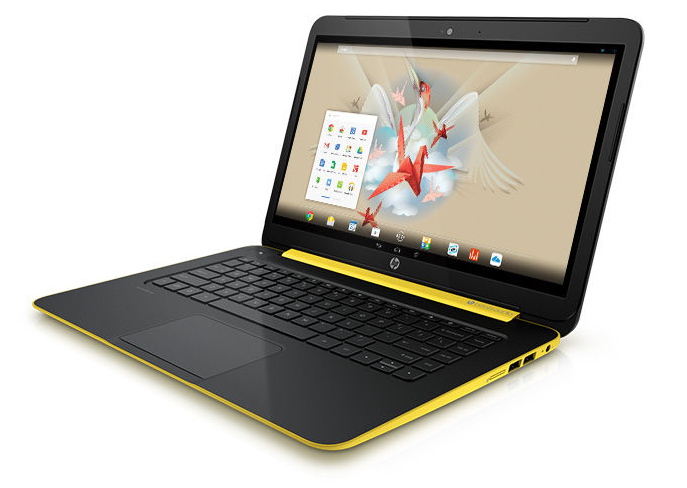 The HP Chromebook is available in Snow White or Ocean Turquoise. 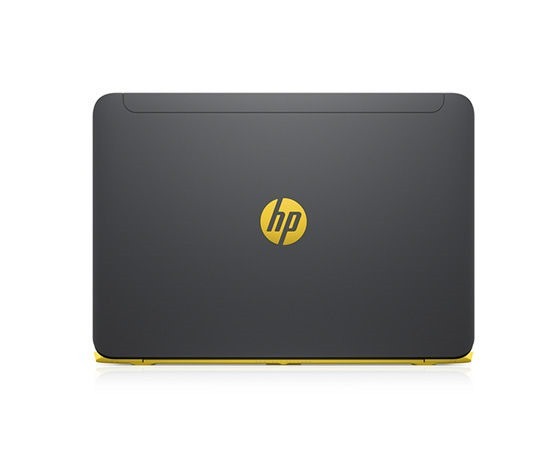 Plus, up to six hours of battery life(4) makes the HP Chromebook PC an ideal companion for customers who want a stylish Chromebook at a great price. The HP SlateBook is a sleek, lightweight Android-powered notebook that gives customers access to the more than 1 million Android apps and games on Google Play in a more productive form factor. Equipped with a 14-inch Full HD touch screen, this compact, 16-mm thin notebook provides up to nine hours of battery life. (5) An NVIDIA® Tegra® 4 mobile processor, plus integrated GeForce® graphics, means the notebook lets users keep up with tasks at the office, home or on the go. HP SmartFriend now provides one-on-one assistance to help customers manage their privacy settings on social media accounts like Facebook and Twitter, protect themselves from phishing and other online scams, and prevent third parties from tracking their online activities.